The original settlement of Arden On The Severn was created during the romantic period of the early 1900s in the days when people were delighting in a light opera which depicted the adventures of Robin Hood and his men in Sherwood Forest. The name "Arden" is the name of an ancient forest in England which may have been the inspiration for the naming of the proposed settlement. 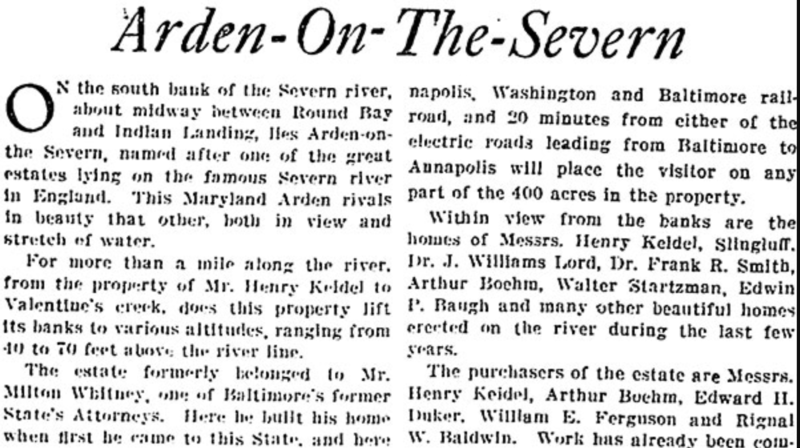 Arden was surveyed in 1911 by J. Spence Howard, whose family was one of the early families of Anne Arundel County. As a result of the survey all roads were laid out to follow the contour of gullies. The original deeds as set out in 1913 had two restrictive covenants: (1) No one occupying land in Arden On The Severn might purchase, convey, possess, manufacture, distribute or consume spirituous beverages and (2) whoever bought a piece of land covenanted not to sell it to "a celestial". In those days, China was called the Celestial Kingdom, so the covenant attempted to keep Asian people from buying. After an influx of Chinese immigrants and workers in the late 1800s, America had taken restrictive measures as racism spread. For many years only two lots in this anti-liquorous, anti-celestial area had houses on them. These homes are located on the Severn at the end of Omar Drive. These houses were built by two doctors from the University of Maryland, who were very close friends and who decided to live as neighbors in Arden. Each was so enthusiastic about his home that he had the builder take a picture every afternoon and send it up to him in Baltimore. When the houses were almost completed, however, the two doctors became so infuriated with each other during a poker game that they refused to live in the same neighborhood. Each man decided to sell his dream house, and neither informed the other of his decision. The two houses were sold almost simultaneously and each man regretted the sale. Your new Arden website and online payment gateway are the result of many months of planning and work by your ABI Board of Directors and a team of website developers and volunteers. Any amount you can contribute to help defray the costs, will be greatly appreciated.